Venlafaxine — brand names: Effexor, Effexor XR, Lanvexin, and Trevilor — is an antidepressant of the serotonin-norepinephrine reuptake inhibitor (SNRI) class. This means it increases the concentrations of the neurotransmitters serotonin and norepinephrine in the body and the brain. First introduced by Wyeth in 1993, now marketed by Pfizer, it is licensed for the treatment of major depressive disorder (MDD), generalised anxiety disorder (GAD), panic disorder and social phobia. Comparative efficacy and acceptability of 12 new-generation antidepressants: a multiple-treatments meta-analysis has shown venlafaxine, alongside mirtazapine, escitalopram and sertraline were significantly more efficacious. Remission rates (defined as a HAM-D score of 7 or less) were 58% for venlafaxine plus mirtazapine. This combination is known by the medical slang term "California rocket fuel". The rate of life-threatening or lethal outcomes for suicidal overdoses of venlafaxine is lower than for the TCAs, MAOIs and bupropion and comparable to several of the SSRIs. It is metabolised in the body into another antidepressant drug called desvenlafaxine (O-desmethylvenlafaxine) which is also sold as an antidepressant, under the brand name Pristiq. Both venlafaxine and paroxetine have been linked to the most severe discontinuation symptoms. In combination with an antipsychotic medicine aripiprazole, better results in treatment resistant depression in older adults have been demonstrated. Venlafaxine is used primarily for the treatment of depression, general anxiety disorder, social phobia, panic disorder and vasomotor symptoms. At low doses (<150 mg/day), it acts only on serotonergic transmission. At moderate doses (>150 mg/day), it acts on serotonergic and noradrenergic systems, whereas at high doses (>300 mg/day), it also affects dopaminergic neurotransmission. Many doctors were starting to prescribe venlafaxine "off label" for the treatment of diabetic neuropathy (in a similar manner to duloxetine) and migraine prophylaxis (in some people, however, venlafaxine can exacerbate or cause migraines). Studies have shown venlafaxine's effectiveness for these conditions, although agents that are marketed for this purpose (like pregabalin or duloxetine) are likely preferred. It has also been found to reduce the severity of 'hot flashes' in menopausal women and men on hormonal therapy for the treatment of prostate cancer. Due to its action on both the serotoninergic and adrenergic systems, venlafaxine is also used as a treatment to reduce episodes of cataplexy, a form of muscle weakness, in patients with the sleep disorder narcolepsy. Some open-label and three double-blind studies have suggested the efficacy of venlafaxine in the treatment of attention deficit-hyperactivity disorder (ADHD). Likewise well-designed clinical trials have found possible efficacy in those with post-traumatic stress disorder (PTSD). Multiple double blind studies show venlafaxine's effectiveness in treating depression. Venlafaxine has similar efficacy to the tricyclic antidepressants amitriptyline (Elavil) and imipramine, and is better tolerated than amitriptyline. Its efficacy is similar to or better than sertraline (Zoloft) and fluoxetine (Prozac), depending on the criteria and rating scales used. Higher doses of venlafaxine are more effective, and more patients achieved remission or were "very much improved". The efficacy was similar if the number of patients who achieved "response" or were "improved" was considered. A meta-analysis comparing venlafaxine and combined groups of SSRI or tricyclic antidepressants showed venlafaxine's superiority. Judged by the same criteria, venlafaxine was similar in efficacy to the atypical antidepressant bupropion (Wellbutrin); however, the remission rate was significantly lower for venlafaxine. In a double-blind study, patients who did not respond to an SSRI were switched to venlafaxine or citalopram. Similar improvement was observed in both groups. Venlafaxine is contraindicated in children, adolescents and young adults. According to the FDA analysis of clinical trials venlafaxine caused a statistically significant 5-fold increase in suicidal ideation and behaviour in persons younger than 25. In another analysis, venlafaxine was no better than placebo among children (7–11 years old), but improved depression in adolescents (12–17 years old). However, in both groups, hostility and suicidal behaviour increased in comparison to those receiving a placebo. In a study involving antidepressants that had failed to produce results in depressed teenagers, teens whose SSRI treatment had failed who were randomly switched to either another SSRI or to venlafaxine showed an increased rate of suicide on venlafaxine. Among teenagers who were suicidal at the beginning of the study, the rate of suicidal attempts and self-harm was significantly higher, by about 60%, after the switch to venlafaxine than after the switch to an SSRI. Patients stopping venlafaxine commonly experience SSRI discontinuation syndrome (otherwise known as "withdrawal" of the same meaning as drugs in the benzodiazepine or opiate classes of medication, for example). The high risk of discontinuation syndrome symptoms may reflect venlafaxine's short half-life. Discontinuation is similar in nature, but not identical to those of SSRIs such as paroxetine (Paxil or Seroxat). Sudden discontinuation of venlafaxine particularly seemed to cause discontinuation symptoms during the first 3 days in a study of 18 patients. As reported in 2001 by Haddad in the journal Drug Safety, "another strategy to consider is switching to fluoxetine, which may suppress the discontinuation symptoms, but which has little tendency to cause such symptoms itself," and then discontinuing that. Norepinephrine may also have a significant role in discontinuation symptoms. During withdrawal from venlafaxine, the levels of both serotonin and norepinephrine decrease, rather than increase, and this would appear to rule out toxic (too high) levels of these neurotransmitters as a likely cause of the withdrawal symptoms. The withdrawal symptoms can be hypothesized to result from an overly rapid deprivation of neurotransmitter levels. 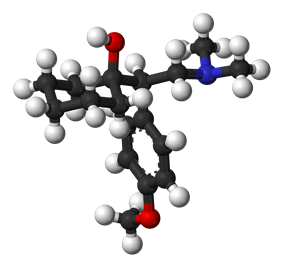 The development of a potentially life-threatening serotonin syndrome (also more recently classified as "serotonin toxicity") may occur with venlafaxine treatment, particularly with concomitant use of serotonergic drugs, including but not limited to SSRIs and SNRIs, many hallucinogens such as tryptamines and phenethylamines (e.g., LSD/LSA, DMT, MDMA, mescaline), dextromethorphan (DXM)/dextrorphan (DXO), tramadol, tapentadol, pethidine (meperidine) and triptans and with drugs that impair metabolism of serotonin (including MAOIs). Serotonin syndrome symptoms may include mental status changes (e.g. agitation, hallucinations, coma), autonomic instability (e.g. tachycardia, labile blood pressure, hyperthermia), neuromuscular aberrations (e.g. hyperreflexia, incoordination) and/or gastrointestinal symptoms (e.g. nausea, vomiting, diarrhea). Venlafaxine-induced serotonin syndrome has also been reported when venlafaxine has been taken in isolation in overdose. An abortive serotonin syndrome state, in which some but not all of the symptoms of the full serotonin syndrome are present, has been reported with venlafaxine at mid-range dosages (150 mg per day). A case of a patient with serotonin syndrome induced by low-dose venlafaxine (37.5 mg per day) has also been reported. Studies of venlafaxine in children have not established its efficacy. Venlafaxine is not recommended in patients hypersensitive to it, nor should it be taken by anyone who is allergic to the inactive ingredients, which include gelatin, cellulose, ethylcellulose, iron oxide, titanium dioxide and hypromellose. It should not be used in conjunction with a monoamine oxidase inhibitor (MAOI), as it can cause potentially fatal serotonin syndrome. There are few well-controlled studies of venlafaxine in pregnant women. A study released in May 2010 by the Canadian Medical Association Journal suggests use of venlafaxine doubles the risk of miscarriage. Consequently, venlafaxine should only be used during pregnancy if clearly needed. Prospective studies have not shown any statistically significant congenital malformations. There have, however, been some reports of self-limiting effects on newborn infants. As with other serotonin reuptake inhibitors (SRIs), these effects are generally short-lived, lasting only 3 to 5 days, and rarely resulting in severe complications. Venlafaxine should be taken with caution when using St John's wort. Venlafaxine may lower the seizure threshold, and coadministration with other drugs that lower the seizure threshold such as bupropion and tramadol should be done with caution and at low doses. Venlafaxine is not recommended nor approved for the treatment of major depressive episodes in bipolar disorder as it can induce mania or mixed episodes. Venlafaxine appears to be more likely than the SSRIs and bupropion to induce mania and mixed episodes in bipolar patients. There have been false positive phencyclidine (PCP) results caused by larger doses of venlafaxine, with certain on-site routine urine-based drug tests. Most patients overdosing with venlafaxine develop only mild symptoms. Plasma venlafaxine concentrations in overdose survivors have ranged from 6 to 24 mg/l, while postmortem blood levels in fatalities are often in the 10–90 mg/l range. Published retrospective studies report that venlafaxine overdosage may be associated with an increased risk of fatal outcome compared to that observed with SSRI antidepressant products, but lower than that for tricyclic antidepressants. 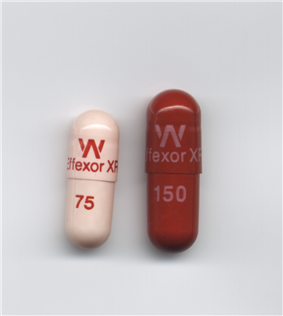 Healthcare professionals are advised to prescribe Effexor and Effexor XR in the smallest quantity of capsules consistent with good patient management to reduce the risk of overdose. It is usually reserved as a second-line treatment for depression due to a combination of its superior efficacy to the first-line treatments like fluoxetine, paroxetine and citalopram and greater frequency of side effects like nausea, headache, insomnia, drowsiness, dry mouth, constipation, sexual dysfunction, sweating and nervousness. There is no specific antidote for venlafaxine, and management is generally supportive, providing treatment for the immediate symptoms. Administration of activated charcoal can prevent absorption of the drug. Monitoring of cardiac rhythm and vital signs is indicated. Seizures are managed with benzodiazepines or other anticonvulsants. Forced diuresis, hemodialysis, exchange transfusion, or hemoperfusion are unlikely to be of benefit in hastening the removal of venlafaxine, due to the drug's high volume of distribution. Venlafaxine is usually categorized as a serotonin-norepinephrine reuptake inhibitor (SNRI), but it has been referred to as a serotonin-norepinephrine-dopamine reuptake inhibitor (SNDRI). It works by blocking the transporter "reuptake" proteins for key neurotransmitters affecting mood, thereby leaving more active neurotransmitters in the synapse. The neurotransmitters affected are serotonin and norepinephrine. Additionally, in high doses it weakly inhibits the reuptake of dopamine, with recent evidence showing that the norepinephrine transporter also transports some dopamine as well, since dopamine is inactivated by norepinephrine reuptake in the frontal cortex. The frontal cortex largely lacks dopamine transporters, therefore venlafaxine can increase dopamine neurotransmission in this part of the brain. Venlafaxine indirectly affects opioid receptors (mu-, kappa1- kappa3- and delta-opioid receptor subtypes) as well as the alpha2-adrenergic receptor, and was shown to increase pain threshold in mice. When mice were tested with a hotplate analgesia meter (to measure pain), both venlafaxine and mirtazapine induced a dose-dependent, naloxone-reversible antinociceptive effect following intraperitoneal injection. These findings suggest venlafaxine's seemingly superior efficacy in severe depression as narcotics become increasingly used as a measure of last resort for refractory cases. Venlafaxine is well absorbed, with at least 92% of an oral dose being absorbed into systemic circulation. It is extensively metabolized in the liver via the CYP2D6 isoenzyme to desvenlafaxine (O-desmethylvenlafaxine), which is just as potent a SNRI as the parent compound, meaning that the differences in metabolism between extensive and poor metabolisers are not clinically important in terms of efficacy. Side effects, however, are reported to be more severe in CYP2D6 poor metabolisers. Steady-state concentrations of venlafaxine and its metabolite are attained in the blood within 3 days. Therapeutic effects are usually achieved within 3 to 4 weeks. No accumulation of venlafaxine has been observed during chronic administration in healthy subjects. The primary route of excretion of venlafaxine and its metabolites is via the kidneys. The half-life of venlafaxine is relatively short, so patients are directed to adhere to a strict medication routine, avoiding missing a dose. Even a single missed dose can result in withdrawal symptoms. Venlafaxine is a substrate of P-glycoprotein (P-gp), which pumps it out of the brain. The gene encoding P-gp, ABCB1, has the SNP rs2032583, with alleles C and T. The majority of people (about 70% of Europeans and 90% of East Asians) have the TT variant. A 2007 study found that carriers of at least one C allele (variant CC or CT) are 7.72 times more likely than non-carriers to achieve remission after 4 weeks of treatment with amitriptyline, citalopram, paroxetine or venlafaxine (all P-gp substrates). The study included patients with mood disorders other than major depression, such as bipolar II; the ratio is 9.4 if these other disorders are excluded. At the 6-week mark, 75% of C-carriers had remitted, compared to only 38% of non-carriers. The chemical structure of venlafaxine is designated (R/S)-1-[2-(dimethylamino)-1-(4 methoxyphenyl)ethyl] cyclohexanol hydrochloride or (±)-1-[a [a- (dimethylamino)methyl] p-methoxybenzyl] cyclohexanol hydrochloride, and it has the empirical formula of C17H27NO2. It is a white to off-white crystalline solid. Venlafaxine is structurally and pharmacologically related to the atypical opioid analgesic tramadol, and more distantly to the newly released opioid tapentadol, but not to any of the conventional antidepressant drugs, including tricyclic antidepressants, SSRIs, MAOIs, or RIMAs. Venlafaxine extended release is chemically the same as normal venlafaxine. The extended release (controlled release) version distributes the release of the drug into the gastrointestinal tract over a longer period than normal venlafaxine. This results in a lower peak plasma concentration. Studies have shown that the extended release formula has a lower incidence of patients suffering from nausea as a side effect, resulting in a lower number of patients stopping their treatment due to nausea. In Australia, New Zealand, Turkey and Switzerland, Wyeth sells their venlafaxine XR tablets under the name "Efexor-XR" (note the spelling with one 'f', rather than "Effexor-XR"). In Brazil, Medley sells a venlafaxine XR capsule under the brand name Alenthus XR. In September 2008, Osmotica Pharmaceuticals began marketing venlafaxine extended release tablets in the United States to compete with Wyeth's capsule-form, Effexor-XR. Sales of branded Efexor XR have remained strong, at US$2.7bn. Per settlement agreements, Teva and Impax began offering generic Effexor XR in the US (with royalties paid to Wyeth); Teva began on July 1, 2010, and Impax on July 1, 2011. Generic venlafaxine is available in the United States as of August 2006 and in Canada as of December 2006 due to patent expiry. Generic forms of the extended-release version have been available in Canada as of January 2007 and currently include Co Venlafaxine XR (Cobalt Pharmaceuticals Inc.), Gen-Venlafaxine XR (Genpharm), Riva-Venlafaxine XR (Laboratoire Riva Inc.), Novo Venlafaxine XR (Novopharm Limited), PMS-Venlafaxine XR (Pharmascience Inc.), Ratio-Venlafaxine XR (ratiopharm), Viepax (in Israel) and Sandoz Venlafaxine XR (Sandoz Canada Inc.). Generic versions of both drug forms are available now in India and Australia. Generic products on the South African market include Venlor SR Capsules (Cipla Medpro) and Illovex SR Tablets (Pharmadynamics, both are available in 150 mg and 75 mg strengths. Generic versions are also available in the UK such as Vaxalin manufactured by RatioPharm GmbH. On May 7, 2010 the Canadian pharmaceutical company IntelliPharmaCeutics Inc. announced that the FDA had accepted its filing for a generic version of Venlafaxine XR utilizing its own proprietary technologies. ^ a b c d e "APO-VENLAFAXINE XR CAPSULES" (PDF). TGA eBusiness Services. Macquarie Park, NSW: Apotex Pty Ltd. 13 April 2012. Retrieved 6 November 2013. ^ a b c d e "VENLAFAXINE (venlafaxine hydrochloride) tablet [Aurobindo Pharma Limited]". DailyMed. Aurobindo Pharma Limited. February 2013. Retrieved 6 November 2013. ^ Muth EA, Haskins JT, Moyer JA, Husbands GE, Nielsen ST, Sigg EB (December 1986). "Antidepressant biochemical profile of the novel bicyclic compound Wy-45,030, an ethyl cyclohexanol derivative". Biochemical Pharmacology 35 (24): 4493–7. ^ Yardley JP, Husbands GE, Stack G, Butch J, Bicksler J, Moyer JA, Muth EA, Andree T, Fletcher H, James MN (October 1990). "2-Phenyl-2-(1-hydroxycycloalkyl)ethylamine derivatives: synthesis and antidepressant activity". Journal of Medicinal Chemistry 33 (10): 2899–905. ^ Bymaster FP, Dreshfield-Ahmad LJ, Threlkeld PG, Shaw JL, Thompson L, Nelson DL, Hemrick-Luecke SK, Wong DT (December 2001). "Comparative affinity of duloxetine and venlafaxine for serotonin and norepinephrine transporters in vitro and in vivo, human serotonin receptor subtypes, and other neuronal receptors" (PDF). Neuropsychopharmacology 25 (6): 871–80. ^ Joint Formulary Committee (2013). British National Formulary (BNF) (65 ed.). London, UK: Pharmaceutical Press. pp. 254, 255. ^ Rossi S, ed. (2013). Australian Medicines Handbook (2013 ed.). Adelaide: The Australian Medicines Handbook Unit Trust. ^ White N, Litovitz T, Clancy C (December 2008). "Suicidal antidepressant overdoses: a comparative analysis by antidepressant type.". Journal of Medical Toxicology 4 (4): 238–50. ^ Pae CU (December 2011). "Desvenlafaxine in the treatment of major depressive disorder.". Expert Opinion on Pharmacotherapy 12 (18): 2923–8. ^ The number of prescriptions was calculated as the total of prescriptions for the corresponding generic and brand-name drugs using data from the charts for generic and brand-name drugs. "Top 200 generic drugs by units in 2007.". Drug Topics, Feb 18, 2008. Archived from the original on 18 July 2009. Retrieved 23 October 2008. ^ "venlafaxine-hydrochloride". The American Society of Health-System Pharmacists. Retrieved 3 April 2011. ^ Redrobe JP, Bourin M, Colombel MC, Baker GB (July 1998). "Dose-dependent noradrenergic and serotonergic properties of venlafaxine in animal models indicative of antidepressant activity" (PDF). Psychopharmacology 138 (1): 1–8. ^ Grothe DR, Scheckner B, Albano D (May 2004). "Treatment of pain syndromes with venlafaxine.". Pharmacotherapy 24 (5): 621–9. ^ Mayo Clinic staff (2005). "Beyond hormone therapy: Other medicines may help". Hot flashes: Ease the discomfort of menopause. Mayo Clinic. Retrieved 19 August 2005. ^ Schober CE, Ansani NT (2003). "Venlafaxine hydrochloride for the treatment of hot flashes". The Annals of Pharmacotherapy 37 (11): 1703–7. ^ "Medications". Stanford University School of Medicine, Center for Narcolepsy. 7 February 2003. Retrieved 3 September 2007. ^ Ghanizadeh A, Freeman RD, Berk M (March 2013). "Efficacy and adverse effects of venlafaxine in children and adolescents with ADHD: a systematic review of non-controlled and controlled trials". ^ Pae CU, Lim HK, Ajwani N, Lee C, Patkar AA (June 2007). "Extended-release formulation of venlafaxine in the treatment of post-traumatic stress disorder.". Expert Review of Neurotherapeutics 7 (6): 603–15. ^ Golden RN, Nicholas L (2000). "Antidepressant efficacy of venlafaxine". Depression and Anxiety. 12 Suppl 1: 45–9. ^ Thase ME, Clayton AH, Haight BR, Thompson AH, Modell JG, Johnston JA (2006). "A double-blind comparison between bupropion XL and venlafaxine XR: sexual functioning, antidepressant efficacy, and tolerability". Journal of Clinical Psychopharmacology 26 (5): 482–8. ^ Lenox-Smith AJ, Jiang Q (2008). "Venlafaxine extended release versus citalopram in patients with depression unresponsive to a selective serotonin reuptake inhibitor". International Clinical Psychopharmacology 23 (3): 113–9. ^ Gibbons RD, Brown CH, Hur K, Davis J, Mann JJ (June 2012). "Suicidal thoughts and behavior with antidepressant treatment: reanalysis of the randomized placebo-controlled studies of fluoxetine and venlafaxine". Arch. Gen. Psychiatry 69 (6): 580–7. ^ Tiihonen J, Lönnqvist J, Wahlbeck K, Klaukka T, Tanskanen A, Haukka J (December 2006). "Antidepressants and the risk of suicide, attempted suicide, and overall mortality in a nationwide cohort" (PDF). Archives of General Psychiatry 63 (12): 1358–67. ^ Rubino A, Roskell N, Tennis P, Mines D, Weich S, Andrews E (2007). "Risk of suicide during treatment with venlafaxine, citalopram, fluoxetine, and dothiepin: retrospective cohort study" (PDF). British Medical Journal 334 (7587): 242. ^ a b "Overview for December 13 Meeting of Psychopharmacologic Drugs Advisory Committee" (PDF). Food and Drug Administration: Center for Drug Evaluation and Research. 16 November 2006. Archived (PDF) from the original on 16 March 2007. Retrieved 20 June 2007. ^ Emslie GJ, Findling RL, Yeung PP, Kunz NR, Li Y (2007). "Venlafaxine ER for the treatment of pediatric subjects with depression: results of two placebo-controlled trials". Journal of the American Academy of Child and Adolescent Psychiatry 46 (4): 479–88. ^ Brent DA, Emslie GJ, Clarke GN, Asarnow J, Spirito A, Ritz L, Vitiello B, Iyengar S, Birmaher B, Ryan ND, Zelazny J, Onorato M, Kennard B, Mayes TL, Debar LL, McCracken JT, Strober M, Suddath R, Leonard H, Porta G, Keller MB (April 2009). "Predictors of spontaneous and systematically assessed suicidal adverse events in the treatment of SSRI-resistant depression in adolescents (TORDIA) study" (PDF). The American Journal of Psychiatry 166 (4): 418–26. ^ a b Haddad PM (March 2001). "Antidepressant discontinuation syndromes" (PDF). Drug Safety 24 (3): 183–97. ^ Fava M, Mulroy R, Alpert J, Nierenberg AA, Rosenbaum JF (December 1997). "Emergence of adverse events following discontinuation of treatment with extended-release venlafaxine". The American Journal of Psychiatry 154 (12): 1760–2. ^ Campagne DM (2005). "Venlafaxine and Serious Withdrawal Symptoms: Warning to Drivers". Medscape General Medicine (Ncbi.nlm.nih.gov) 7 (3): 22. ^ Dunkley EJ, Isbister GK, Sibbritt D, Dawson AH, Whyte IM (September 2003). "The Hunter Serotonin Toxicity Criteria: simple and accurate diagnostic decision rules for serotonin toxicity" (PDF). QJM: Monthly Journal of the Association of Physicians 96 (9): 635–42. ^ Kolecki P (July–August 1997). "Isolated venlafaxine-induced serotonin syndrome". Journal of Emergency Medicine 15 (4): 491–3. ^ Ebert D, et al. "Hallucinations as a side effect of venlafaxine treatment". Psychiatry On-line. Retrieved 17 June 2008. ^ Pan JJ, Shen WW (February 2003). "Serotonin syndrome induced by low-dose venlafaxine". The Annals of Pharmacotherapy 37 (2): 209–11. ^ Courtney DB (2004). "Selective serotonin reuptake inhibitor and venlafaxine use in children and adolescents with major depressive disorder: a systematic review of published randomized controlled trials". Canadian Journal of Psychiatry 49 (8): 557–63. ^ David Taylor; Carol Paton; Shitij Kapur, eds. (2012). The Maudsley Prescribing Guidelines in Psychiatry (illustrated ed.). John Wiley & Sons. ^ a b c "Effexor Medicines Data Sheet". Wyeth Pharmaceuticals Inc. 2006. Archived from the original on 17 September 2006. Retrieved 17 September 2006. ^ Broy P, Bérard A (2010). "Gestational exposure to antidepressants and the risk of spontaneous abortion: A review". 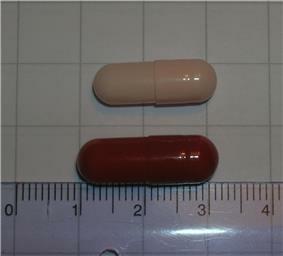 Current drug delivery 7 (1): 76–92. ^ Nakhai-Pour HR, Broy P, Bérard A (2010). "Use of antidepressants during pregnancy and the risk of spontaneous abortion". Canadian Medical Association Journal 182 (10): 1031–1037. ^ Gentile S (2005). "The safety of newer antidepressants in pregnancy and breastfeeding". Drug Saf 28 (2): 137–52. ^ de Moor RA, Mourad L, ter Haar J, Egberts AC (2003). "[Withdrawal symptoms in a neonate following exposure to venlafaxine during pregnancy]". Ned Tijdschr Geneeskd 147 (28): 1370–2. ^ Ferreira E, Carceller AM, Agogué C, Martin BZ, St-André M, Francoeur D, Bérard A (2007). "[Effects of selective serotonin reuptake inhibitors and venlafaxine during pregnancy in term and preterm neonates]". Pediatrics 119 (1): 52–9. ^ Moses-Kolko EL, Bogen D, Perel J, Bregar A, Uhl K, Levin B, Wisner KL (2005). "Neonatal signs after late in utero exposure to serotonin reuptake inhibitors: Literature review and implications for clinical applications". The Journal of the American Medical Association 293 (19): 2372–83. ^ Karch, A (2006). 2006 Lippincott's Nursing Drug Guide. Philadelphia, Baltimore, New York, London, Buenos Aires, Hong Kong, Sydney, Tokyo: Lippincott Williams & Wilkins. ^ Thundiyil JG, Kearney TE, Olson KR (March 2007). "Evolving epidemiology of drug-induced seizures reported to a Poison Control Center System" (PDF). Journal of Medical Toxicology 3 (1): 15–9. ^ Pacchiarotti I, Bond DJ, Baldessarini RJ, Nolen WA, Grunze H, Licht RW, Post RM, Berk M, Goodwin GM, Sachs GS, Tondo L, Findling RL, Youngstrom EA, Tohen M, Undurraga J, González-Pinto A, Goldberg JF, Yildiz A, Altshuler LL, Calabrese JR, Mitchell PB, Thase ME, Koukopoulos A, Colom F, Frye MA, Malhi GS, Fountoulakis KN, Vázquez G, Perlis RH, Ketter TA, Cassidy F, Akiskal H, Azorin JM, Valentí M, Mazzei DH, Lafer B, Kato T, Mazzarini L, Martínez-Aran A, Parker G, Souery D, Ozerdem A, McElroy SL, Girardi P, Bauer M, Yatham LN, Zarate CA, Nierenberg AA, Birmaher B, Kanba S, El-Mallakh RS, Serretti A, Rihmer Z, Young AH, Kotzalidis GD, MacQueen GM, Bowden CL, Ghaemi SN, Lopez-Jaramillo C, Rybakowski J, Ha K, Perugi G, Kasper S, Amsterdam JD, Hirschfeld RM, Kapczinski F, Vieta E (November 2013). "The International Society for Bipolar Disorders (ISBD) task force report on antidepressant use in bipolar disorders". The American Journal of Psychiatry 170 (1): 1249–62. ^ Santos PM, López-García P, Navarro JS, Fernández AS, Sádaba B, Vidal JP (February 2007). "False positive phencyclidine results caused by venlafaxine" (PDF). The American Journal of Psychiatry 164 (2): 349. ^ Sena SF, Kazimi S, Wu AH (April 2002). "False-positive phencyclidine immunoassay results caused by venlafaxine and O-desmethylvenlafaxine" (PDF). Clinical Chemistry 48 (4): 676–7. ^ R. Baselt (2008). Disposition of Toxic Drugs and Chemicals in Man (8th ed.). Foster City, CA: Biomedical Publications. pp. 1634–1637. ^ "Wyeth Letter to Health Care Providers". Wyeth Pharmaceuticals Inc. 2006. Retrieved 6 August 2009. ^ Taylor D, Lenox-Smith A, Bradley A (June 2013). "A review of the suitability of duloxetine and venlafaxine for use in patients with depression in primary care with a focus on cardiovascular safety, suicide and mortality due to antidepressant overdose.". Therapeutic Advances in Psychopharmacology 3 (3): 151–61. ^ Hanekamp BB, Zijlstra JG, Tulleken JE, Ligtenberg JJ, van der Werf TS, Hofstra LS (2005). "Serotonin syndrome and rhabdomyolysis in venlafaxine poisoning: a case report" (PDF). The Netherlands Journal of Medicine 63 (8): 316–8. ^ "Acute Effectiveness of Additional Drugs to the Standard Treatment of Depression". ClinicalTrials.gov. 2008. Retrieved 21 November 2013. ^ Goeringer KE, McIntyre IM, Drummer OH (2001). "Postmortem tissue concentrations of venlafaxine". Forensic Science International 121 (1–2): 70–5. ^ Wellington K, Perry CM (2001). "Venlafaxine extended-release: a review of its use in the management of major depression" (PDF). CNS Drugs 15 (8): 643–69. ^ "Stahl's Essential Psychopharmacology – Cambridge University Press". Stahlonline.cambridge.org. Retrieved 21 November 2013. ^ Delgado PL, Moreno FA (2000). "Role of norepinephrine in depression". Journal of Clinical Psychiatry 61 (Suppl. 1): 5–12. ^ Schreiber S, Bleich A, Pick CG (February–April 2002). "Venlafaxine and mirtazapine: different mechanisms of antidepressant action, common opioid-mediated antinociceptive effects—a possible opioid involvement in severe depression?". Journal of Molecular Neuroscience, MN 18 (1–2): 143–9. ^ Shams ME, Arneth B, Hiemke C, Dragicevic A, Müller MJ, Kaiser R, Lackner K, Härtter S; Arneth; Hiemke; Dragicevic; Müller; Kaiser; Lackner; Härtter (October 2006). "CYP2D6 polymorphism and clinical effect of the antidepressant venlafaxine". Journal of Clinical Pharmacy and Therapeutics 31 (5): 493–502. ^ Parker G, Blennerhassett J; Blennerhassett (April 1998). "Withdrawal reactions associated with venlafaxine". The Australian and New Zealand Journal of Psychiatry 32 (2): 291–4. ^ "Rs2032583 -SNPedia". Snpedia.com. Retrieved 21 November 2013. ^ Uhr M, Tontsch A, Namendorf C, Ripke S, Lucae S, Ising M, Dose T, Ebinger M, Rosenhagen M, Kohli M, Kloiber S, Salyakina D, Bettecken T, Specht M, Pütz B, Binder EB, Müller-Myhsok B, Holsboer F; Tontsch; Namendorf; Ripke; Lucae; Ising; Dose; Ebinger; Rosenhagen; Kohli; Kloiber; Salyakina; Bettecken; Specht; Pütz; Binder; Müller-Myhsok; Holsboer (2008). "Polymorphisms in the drug transporter gene ABCB1 predict antidepressant treatment response in depression". Neuron 57 (2): 203–209. ^ Whyte IM, Dawson AH, Buckley NA; Dawson; Buckley (May 2003). "Relative toxicity of venlafaxine and selective serotonin reuptake inhibitors in overdose compared to tricyclic antidepressants" (PDF). QJM: Monthly Journal of the Association of Physicians 96 (5): 369–74. ^ DeVane CL (2003). "Immediate-release versus controlled-release formulations: pharmacokinetics of newer antidepressants in relation to nausea". Journal of Clinical Psychiatry 64 (Suppl 18): 14–9. ^ "Efexor Xr 150 Mg 14 Kap – İlaç Prospektüsü" [Efexor Xr 150 Mg 14 Download – Drug Leaflet] (in French). Ilacprospektusu.com. 29 May 2009. Retrieved 21 November 2013. ^ "Effexor xr patent expiration date, patent status, and tentative generic approvals – WYETH PHARMS INC: venlafaxine hydrochloride". Drugpatentwatch.com. Retrieved 21 November 2013. ^ "Wyeth Reports Earnings Results for the 2005 Fourth Quarter and Full Year" (PDF). Archived from the original (PDF) on 19 November 2006. ^ "Wyeth and Impax Announce Final Settlement of Effexor XR Patent Suit". July 2008. Retrieved 17 December 2013. Under the terms of the settlement, Wyeth has granted Impax a license that would permit Impax to launch its capsule formulation of Effexor XR on or after June 1, 2011, subject to earlier launch in limited circumstances, but in no event earlier than January 1, 2011. Impax will pay Wyeth a royalty on sales of this generic product. ^ "Marketing authorisations granted in July 2008" (PDF). Mhra.gov.uk. Retrieved 21 November 2013. ^ "FDA Accepts for Filing Intellipharmaceutics' ANDA for Generic Effexor XR(R)". Intellipharmaceutics. Retrieved 21 November 2013.